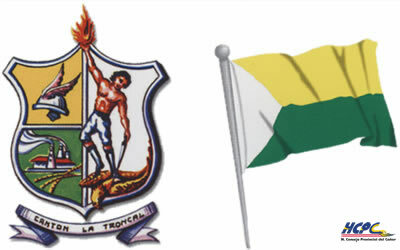 Flag and Coat of Arms at Consejo Provincial del Cañar site. Adoption date is 7 January 1985. 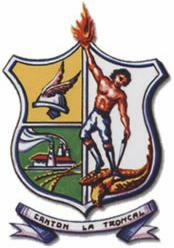 The municipality was formed on 25 August 1983. The symbols were designed by the artist Jorge Mogrovejo Calle, winner of a competition organized on 7 January 1985 by the Municipal Council. The real flag is shown on a photograph of the Mayor in his office. The municipal gazette shows a black and white drawing of the flag charged with the coat of arms: There is no hint that such a flag ever existed.